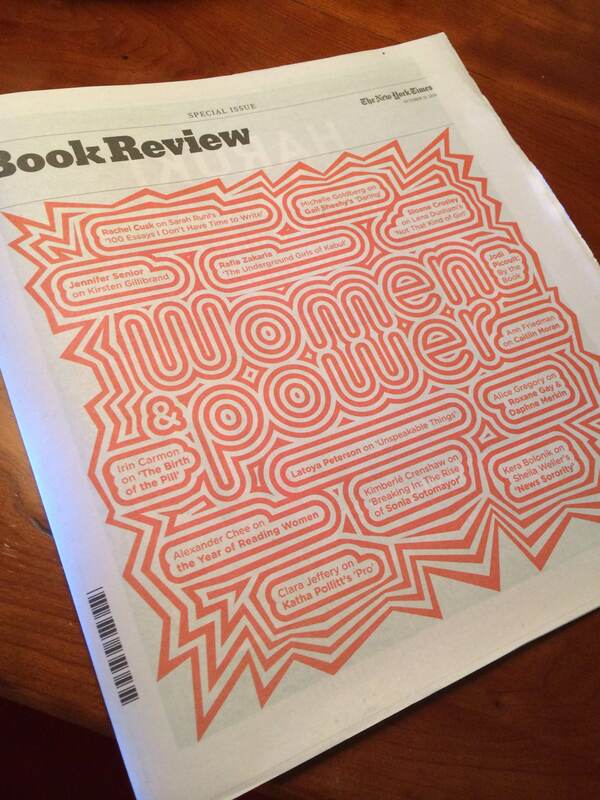 This weekend, I was honored to have an Author’s Note column in the New York Times Sunday Book Review’s special double issue devoted to women writers. The column, “Gender Genre”, is about some of what I learned during a period of almost three years when I stopped reading men, starting when I was 20, and came from thinking about the current crisis we are in, which is the old crisis we have been in for so very long, which is that women are not treated as human. The idea back then came from a class I briefly describe in the column, Modernity: Gender and War, taught by the late Hope Weissman, one of my very favorite professors. Professor Weissman was a Wife of Bath expert, and also taught Chaucer, which I also took with her–even doing my paper on the Wife of Bath, which is how I discovered her expertise. There was a very grim moment during the writing of my final paper when I understood I would be citing her own work in the presentation of my ideas. The paper went well, but I would say I learned to be careful there. I know at least a few will imagine that I was being taught the ideas of some kind of radical feminist in the lead-up to the period my column describes, and it may be a way to describe Professor Weissman, but I would say only that we were reading Paul Fussell’s The Great War and Modern Memory. In it, he describes the way the mechanization of war in World War I dismantled the conventions of Western culture, in which men were taught to fight for honor: their honor, the honor of their family, the honor of their country. To do so, they were allowed a kind of license we give to heroes even before they were heroes, as a way to get them to go and be heroes. When war was mechanized, the honor left–both surviving or dying no longer meant what it had, and so this kind of role for men was meaningless. The entire system is still in place, though it has nowhere to go. And so all of the violence it permits also has nowhere to go. Instead, we live with it, or, we try to–a machine that no longer has a purpose, or at least, no longer the purpose it once did, still making boys think they are superhuman–and women, less than human. A conveyor belt full of bright shiny toys that ends in a cement wall. I think we can say, 100 years after that war, the world still has not adapted to what happened then. I’ll be blogging more later this week about that column and the reading I did then. Alex,, This is fascinating. I wonder if Virginia Woolf, along with her horror of the First World War and its many deaths, sensed this shift to mechanization and away from a sense of honor– and implicit in honor is meaning, I think.